Mars Opportunity Rover Was A NASA Exploration Rover. Mars Opportunity rover was sent by NASA to explore the surface of Mars. Mars Opportunity Rover is the second of the two rovers of NASA's Mars Exploration Rover Mission. Mars Opportunity Rover landed successfully at Meridiani Planum on Mars on January 25, 2004 05:05 Ground UTC (circa 13:15 local time), three weeks after her twin Spirit rover (MER-A) had landed on the other side of the planet. Mars Opportunity Rover's name was chosen through a NASA-sponsored student essay competition. Mars Opportunity Rover has continued to function effectively over ten times longer than NASA planners expected, allowing her to perform extensive geological analysis of Martian rocks and planetary surface features; As of 2007 her mission is ongoing. An archive of approximately weekly updates on her status can be found at the NASA/JPL website. 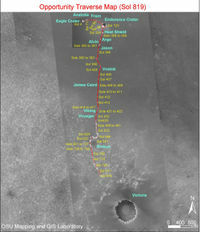 Mission overview of Mars Opportunity Rover. 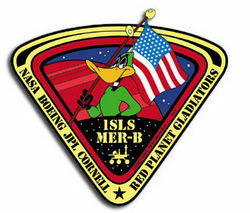 The launch patch for Opportunity rover, featuring Duck Dodgers (Daffy Duck). Mars Global Surveyor orbiter's photograph of landing site showing "hole in one." (See also: simulation of Opportunity's trajectory on arrival at Mars in January 2004. The primary surface mission for Opportunity was planned to last 90 sols. The mission has received several extensions and as of November 17, 2006 had passed 1000 sols. From her initial landing, by chance, into an impact crater amidst an otherwise generally flat plain, Opportunity has successfully investigated soil and rock samples and taken panoramic photos of her landing site. Her sampling allowed NASA scientists to make hypotheses concerning the presence of hematite and past presence of water on the surface of Mars. Following this, she was directed to travel across the surface of Mars to investigate another crater site, Endurance crater, which she investigated from June - December 2004. 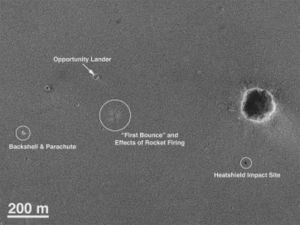 Subsequently, Opportunity examined the impact site of its own Heat Shield and discovered an intact meteorite, now known as Heat Shield Rock, on the surface of Mars. 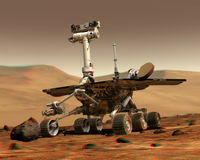 Artist's Concept of Rover on Mars (credit: Maas Digital LLC). From late April 2005 to early June of that year, Opportunity was perilously lodged in a sand dune, with several wheels buried in the sand. Over a six week period Earth-based physical simulations were performed to decide how best to extract the rover from its position without risking a permanent immobilization of the valuable vehicle. Successful maneuvering a few centimeters at a time eventually freed the rover, which resumed its travels. Opportunity was directed to proceed in a southerly direction to Erebus crater, a large, shallow, partially buried crater and a stopover on the way south towards "Victoria" crater, between October 2005 and March 2006. It experienced some mechanical problems with its robotic arm. In late September 2006 Opportunity reached the rim of Victoria crater and is currently exploring along the rim in a clockwise direction. Feasible routes into the crater are being sought, and it is likely that Opportunity will be sent into Victoria crater in early 2007. In over two earth years of functioning, the rover has traversed over 9,000 meters. Both Spirit and Opportunity have pieces of the fallen World Trade Center's metal on them. Landing site of Mars Opportunity Rover: "Eagle" crater. Opportunity's first 360-degree grayscale panorama, taken by the navcam on Sol 1 of the mission, showing interior of Eagle crater at Meridiani Planum, shortly after touchdown. Opportunity landed in Meridiani Planum at 354.4742ºE 1.9483ºS (areocentric coordinates), about 24 km downrange (east) of her intended target. Although Meridiani is a flat plain, without the rock fields seen at previous Mars landing sites, Opportunity rolled into an impact crater approximately 20 meters in diameter, with the rim of the crater approximately 10 meters (32 feet) from the rover. NASA Scientists were so excited about landing in a crater that they called the landing a "hole in one." Later, the crater was named Eagle crater. This was the darkest landing site ever visited by a spacecraft on Mars. It would be two weeks before she was able to get a better look of her surroundings. Scientists were intrigued by the abundance of rock outcrops dispersed throughout the crater, as well as the crater's soil, which appeared to be a mixture of coarse gray grains and fine reddish grains. 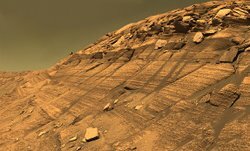 This sweeping look at the unusual rock outcropping near Opportunity was captured by the rover's panoramic camera. Scientists believe the seemingly layered rocks are either volcanic ash deposits or sediments laid down by wind or water. It was given the name Opportunity Ledge. First color panorama taken by Opportunity, showing the Martian landscape at Meridiani Planum, shortly after she touched down. Geologists said that the layers-some no thicker than a finger-indicate the rocks likely originated either from sediments carried by water or wind, or from falling volcanic ash. "We should be able to distinguish between those two hypotheses", said Dr. Andrew Knoll of Harvard University, Cambridge, a member of the science team for Opportunity and her twin, Spirit. If the rocks are sedimentary, water is a more likely source than wind, he said. These layered rocks measure only 10 centimeters (4 inches) tall and are thought to be either volcanic ash deposits or sediments carried by water or wind. The layers are very thin measuring just a few millimeters thick in some cases. On January 28, 2004, NASA announced that the landing site was being named to honor the seven Astronauts of Space Shuttle Challenger's mission STS-51-L who were killed when the shuttle exploded shortly after launch on January 28, 1986. This panorama of Eagle crater shows outcroppings, which are thought to have water origins. On Sol 15, Opportunity took a close up of the rock "Stone Mountain" in the outcrop area of the crater, raising speculation that the rock consisted of very fine grain or dust, in contrast to Earth sandstone, which is compacted sand with rather large grains. The weathering agent eroding away layers of this rock seemed to be visible as dark spots. A picture received on February 10 (taken on Sol 16) showed that the thin layers in the bedrock converge and diverge at low angles, suggesting that some "moving current" such as volcanic flow, wind, or water formed these rocks. The discovery of these layers was significant for scientists who had planned this mission to test the "water hypothesis" rigorously. On February 19 the survey of "Opportunity Ledge" was declared successful. A specific target in the outcrop (dubbed "El Capitan"), whose upper and lower portions appeared to differ in layering and weathering characteristics, was selected for further investigation. El Capitan, about 10 centimeters (4 inches) high, was named after a mountain in Texas. Opportunity reached "El Capitan" on Sol 27, and took first picture of the rocks with her panoramic camera. On Sol 30, Opportunity used her Rock Abrasion Tool (RAT) for the first time to investigate the rocks around El Capitan. The image on the right-hand side shows a close up view taken after the drilling and cleaning process was complete. Due to chance, two spherules were also cut partially, and seem to show scratches and other marks made by the diamond-crusted grind tool. The black areas are artifacts of the imaging process, when parts of the picture are missing. During a press conference on March 2 mission scientists discussed their conclusions about the bedrock, and the evidence for the presence of liquid water during their formation. They presented the following reasoning to explain the small, elongated voids in the rock visible on the surface and after grinding into it (see last two images below). These voids are consistent with features known to geologists as "vugs". These are formed when crystals form inside a rock matrix and are later removed through erosive processes, leaving behind voids. Some of the features in this picture are "disk-like", which is consistent with certain types of crystals, notably sulfate minerals. Additionally, mission members presented first data from the Mossbauer spectrometer taken at the bedrock site. The iron spectrum obtained from the rock El Capitan shows strong evidence for the mineral jarosite. This mineral contains hydroxyl radicals, which indicates the presence of water when the minerals were formed. Mini-TES data from the same rock showed that it consists of a considerable amount of sulfates. Close up of a rock outcrop. Thin Rock layers, not all parallel to each other. Section of hole created by RAT. 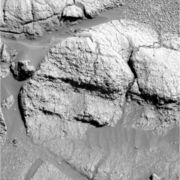 Mars Opportunity Rover digs a trench. 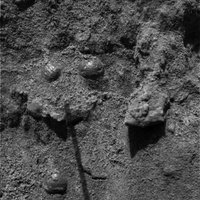 This image, taken by the microscopic imager, reveals shiny, spherical objects embedded within the trench wall. The view of Burns Cliff inside of Endurance Crater. The rover alternately pushed soil forward and backward out of the trench with its right front wheel while other wheels held the rover in place. The rover turned slightly between bouts of digging to widen the hole. "We took a patient, gentle approach to digging", Biesiadecki said. The process lasted 22 minutes. The resulting trench-the first dug by either Mars Exploration Rover-is about 50 centimeters (20 inches) long and 10 centimeters (4 inches) deep. "It came out deeper than I expected", said Dr. Rob Sullivan of Cornell University, Ithaca, N.Y., a science-team member who worked closely with engineers to plan the digging. Two features that caught scientists' attention were the clotty texture of soil in the upper wall of the trench and the brightness of soil on the trench floor, Sullivan said. By inspecting the sides and floor of a hole it dug, Opportunity is finding some things it did not see beforehand, including round pebbles that are shiny and soil so fine-grained that the rover's microscope can't make out individual particles. "What's underneath is different than what's at the immediate surface", said Dr. Albert Yen, rover science team member at NASA's Jet Propulsion Laboratory, Pasadena, Calif.
Mars Opportunity Rover: Endurance Crater. On April 30, 2004 Opportunity reached Endurance crater, which was known to have many layers of rocks. In May the rover circumnavigated the crater, and made observations with Mini-TES and the panoramic camera. The rock "Lion Stone" was investigated and found to be similar in composition to the layers found in Eagle crater. 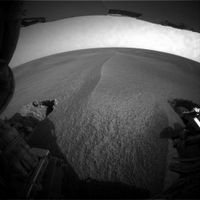 On June 4, 2004 mission members announced their intention to drive Opportunity into Endurance, even if it should turn out to be impossible to get back out, targeting the various rock layers that were identified in the pictures from the crater rim. "This is a crucial and careful decision for the Mars Exploration Rovers' extended mission", said Dr. Edward Weiler, NASA's associate administrator for space science. Dr Squyres, principal investigator from Cornell University said: "Answering the question of what came before the evaporites is the most significant scientific issue we can address with Opportunity at this time." A first drive into the crater was executed June 8 and Opportunity backed out again the same day. It was found that the angle of the surface was well inside the safety margin (about 18 degrees), and the full excursion towards the rock layer of interest was started. During Sols 134 (June 12), 135, and 137 the rover drove deeper and deeper into the crater, each time executing the drive exactly as planned. Wispy clouds, similar to Earth's cirrus clouds, were spotted. Mars Opportunity Rover spent roughly 180 sols inside the crater, before backing out of it again in late December 2004. Endurance Crater panorama (grayscale). Rock layer inside Endurance at Karatepe. Mars Opportunity Rover: Heat Shield Rock. Heat Shield Rock was the first meteorite ever identified on another celestial object. After exiting Endurance crater, in January 2005 Opportunity went to examine its own discarded Heat Shield. While in the vicinity of the heat shield, it happened to come upon an object which was immediately suspected and soon confirmed to be a meteorite. The meteorite was promptly named Heat Shield Rock, and is the first meteorite identified on another planet or moon. After about 25 Sols of observations Opportunity headed south for a crater named Argo, nearly 300 m from the heat shield. Mars Opportunity Rover: Southern transit. The rover was commanded to dig another trench on the vast plains of Meridiani Planum, on Sol 366, and observations continued until Sol 373 (February 10, 2005). The rover then passed the craters "Alvin" and "Jason", and by Sol 387, approached a "crater triplet" on its way to Vostok Crater. Along the way, Opportunity set a distance record for one-day travel by either rover: 177.5 meters (582 feet), on February 19, 2005. On Sol 389 (February 26, 2005), the rover approached one of the three craters, dubbed Naturaliste. 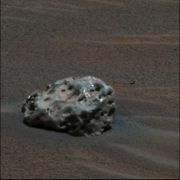 A rock target named "Normandy" was chosen for investigation on Sol 392, and Opportunity remained there until Sol 395. Opportunity reached Vostok Crater on Sol 399, finding it mostly filled with sand and lined by outcrops. It was then ordered south into what has been called "etched terrain", to search for more bedrock. 360º Panorama at crater triplet, all three craters in right half of image, Naturaliste Crater in foreground. By Sol 415, Opportunity stopped by some soil ripples to investigate the differences between soil in the trough of a ripple and its crest. Various soil targets included "Mobarak" in the trough, named in honor of Persian New Year, and "Norooz" and "Mayberooz" on the crest. By Sol 421, the rover left the ripple for "Viking" crater. Mars Opportunity Rover gets stuck. On April 26 (Sol 446) Opportunity inadvertently dug itself into a sand dune: Mission scientists reported that images indicated all four corner wheels were dug in by more than a wheel radius, just as the rover attempted to climb over a dune about 30 centimeters (12 inches) tall. The sand dune was designated "Purgatory Dune" by mission planners. The rover's condition was simulated on Earth prior to any attempt to move, out of concern that the rover might become permanently immobilized. After various simulations intended to mimic the properties and behavior of Martian sand were completed, the rover executed its first wheel movements on May 13 (Sol 463), intentionally advancing only a few centimeters, after which mission members evaluated the results. Dug in back wheels on Sol 468. During Sol 465 and 466 more drive commands were executed, and with each trial the rover moved another couple of centimeters. At the end of each movement, panoramic images were acquired to investigate the atmosphere and the surrounding dune field. The sand dune escape maneuver was successfully completed on June 4 (Sol 484), and all six wheels of Opportunity were on firmer ground. After studying "Purgatory" from sol 498 to sol 510, Opportunity proceeded southwards towards "Erebus crater". Mars Opportunity Rover: Erebus crater, mild mechanical problems. Opportunity studied Erebus crater, a large, shallow, partially buried crater and a stopover on the way south towards Victoria crater, between October 2005 and March 2006. New programming to measure the percentage of slip in the wheels was successful in preventing the rover from getting stuck. Another "Purgatory"-like incident was averted on sol 603, when onboard slip check software stopped a drive after slip reached 44.5%. It proceeded over many ripples and 'half-pipes' taking photographs after each sol's journey. On sol 628 (November 3, 2005) Opportunity woke up in the midst of a mild dust storm that lasted three days. The rover was able to drive in self protective auto-mode during the storm but could not take any post drive images. Less than three weeks later, another cleaning event cleared the dust off of the solar array so as to produce around 720 watt-hours (80% of max). On sol 649 (December 1, 2005), it was discovered the motor used to stow the robotic arm for travel was stalling. This problem took nearly two weeks to fix. Since then, the arm is only stowed for travel and is extended at night to save the arm from getting stuck. Panorama taken on the rim of Erebus crater. Opportunity observed numerous outcroppings around Erebus crater. It also collaborated with ESA's Mars Express by using the miniature thermal emission spectrometer and panoramic camera, and took images of a transit across the sun by Phobos. On sol 760 (March 22, 2006), Opportunity began the journey to its next destination, "Victoria" crater. Mars Opportunity Rover Latest status. Opportunity at the rim of Victoria Crater, as imaged by MRO (03 October 2006). Opportunity at the rim of Victoria Crater, as imaged by MRO (2006-11-29). Opportunity landing site, parachute and backshell, as imaged by MRO (2006-11-29). Opportunity landing site, heat shield, as imaged by MRO (2006-11-29). Opportunity traverse map, through sol 819 (14 May 2006). Victoria crater is a massive impact crater approximately 7 kilometers from the original landing site. Victoria's diameter is six times larger than Endurance crater. Scientists believe that rock outcrops along the walls of Victoria will yield more information about the geologic history of Mars, if the rover survives long enough to investigate them. On Sol 951 (September 26, 2006) Opportunity reached the rim of Victoria Crater and transmitted the first substantial views of Victoria, including the dune field at the bottom of the crater. The Mars Reconnaissance Orbiter recently photographed Opportunity at the rim of the crater. Opportunity's total odometry as of sol 1080 (February 6, 2007) was 10,023.19 meters (6.23 miles). Scientific findings of Mars Opportunity Rover. Opportunity has provided substantial evidence in support of the mission's primary scientific goals: to search for and characterize a wide range of rocks and soils that hold clues to past water activity on Mars. In addition to investigating the "water hypothesis", Opportunity has also obtained astronomical observations and atmospheric data. Honors for Mars Opportunity Rover. Honoring Opportunity's great contribution to the exploration of Mars, the asteroid 39382 has been named Opportunity. The name was proposed by Ingrid van Houten-Groeneveld who along with Cornelis Johannes van Houten and Tom Gehrels discovered the asteroid on September 24, 1960.